During peak summer season, the Cheap flights to Victoria Falls are mostly loaded with tourists, so one needs to be more careful and plan in advance in order to secure their seats. Victoria Falls are labeled as the chief natural wonder of Africa, home to a habitat of avifauna, aqua fauna and general wildlife species. All Victoria Falls flights land towards the Zimbabwe side of the falls, at the Victoria Falls International Airport. International flights are mostly focused upon Johannesburg, which total to about 50 in frequency every week. Both Business class and Economy class seats are available for booking cheap flight tickets to Victoria Falls with TravelhouseUK, which is deals in contracts with carriers such as South African Airways, British Airways and Lufthansa Airlines for the purpose. 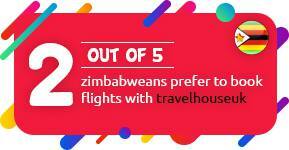 which airlines fly from uk to victoria falls? what is the cheapest airlines to fly from London to Victoria falls? South African Airways is considered as preferred airline for traveling from London to Victoria Falls. What are the entry requirements for Victoria Falls city? Provided that the traveller is a British National, UK passport holders do not require any additional documentation when entering Victoria Falls City. A USD $50 fee is required to apply for the UniVisa upon arriving at the Victoria Falls airport. Which are the major international airports in Victoria Falls city? Victoria Falls city has only one International airport namely Victoria Falls International Airport. It was opened in 2013 and currently hosts domestic and South African Airliners. When is the best time for water sports in Victoria Falls? Water Rafting, river boarding, bridge activities, bungee jumping and the splendour of safari are some of the major water sports. The best time to enjoy water sports at its fullest is in the months of June, July and August. How far is The Victoria Falls International Airport from center city? Victoria Falls Airport is being used to serve the tourism industry of Victoria Falls. It is located at 18 km distance from the town of Victoria Falls. what's the best time to visit Victoria falls? Ideally, Victoria Falls is in its full swing during the month of April and May just after the rainy season. This is when the snow in the highlands has fully melted and the immense torrent of water can be appreciated at optimum capacity. This offers the panoramic views of thundering waterfalls. However, the area around the city comes to a full blossom in spring, in November. What are the major landmarks in Victoria Falls city? Breathe in the mist of the Victoria Falls, as the gushing waters scatter and thunder on stone. Sway with the beating heart of nature, among the elephants and the wildebeests at Zambezi National Park. Rediscover yourself and your loved ones on a sunset cruise over the Zambezi River. Peer over the famous Victoria Falls Bridge, connecting Zambia and Zimbabwe, and let the falling water cleanse your soul. What are the popular things to do in Victoria Falls? For the adrenaline junkies there is the wildest one day white water rafting trip in the world, along with the 111 meter-high bungee jump. For a bit tamed experience there can always be kayaking and river surfing, while having an edge of how to swim in the active currents. What are places to stay in Victoria Falls? Being a host to one of the seven natural wonders of the world, Vic Falls offers some of the best accommodations and hospitality in its region. As soon as the Victoria Falls started gaining popularity in the tourism world, many local hotels in the vicinity up graded their services and equipped themselves with the contemporary amenities to match the standards of international hotel chains. In addition to that, you don’t need to be worried about the budget accommodation because Victoria Falls offers wide-ranging hotels in varying prices with standard facilities. Which are the famous hotels to stay in Victoria Falls? Our experts have chosen a few of the following for the relaxing stay in Victoria Falls. There is no need to ask why; this town named after the spectacular wild card of nature-Victoria Falls, is undoubtedly a heavenly destination. The largest uninterrupted sheet of falling water is hotspot of the tourists from around the world. Whether you want enjoy water splashes by standing on the Knife-Edge Bridge or drown yourself in Devil’s pool, you are surely going to have a historic experience of your life. How to travel around city center of Victoria falls ? need to del this question to The airport provides ‘shuttle services’ to and from the hotels and other places in the town. However, there is a variety of tour operators and car rentals, offering a range of rental vehicles. You can also find the reliable taxis at the airport. How To Get Around The Victoria Falls City? You can get around on foot, as most of the places are almost 3 km away from Victoria Falls. Hence, there are plentiful cabs to carry you within the town. Also, most of the hotels do offer transport services to their guests. What Are The best Hotel And Other Accommodation in Victoria Falls? The majority of options for an accommodation are lodges rather than hotels. Very few hotel options are present in the main towns surrounding Victoria Falls, and they are relatively farther away than the entrance of the falls in comparison to all the lodges surrounding the area. Alternative options are complete lodges with swimming pools and attached restaurants, hospitality safari camps as well as a boutique lodge. Certain clubs are also available to facilitate deluxe suites and rooms. Location options also vary, with some lodges beside the banks of the Zambezi River leading to the falls, as well as some lodges established atop hills overlooking the landscape.